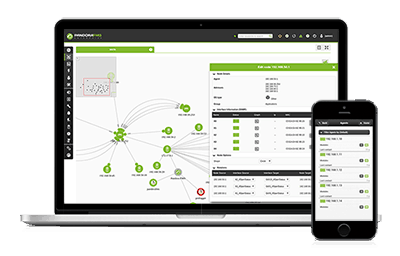 One of the most flexible and complete system monitoring tools on the market. Pandora FMS is one of the most flexible and complete system monitoring tools on the market. With a single on-premise tool you’ll be able to monitor every part of your business (devices, infrastructure, applications, services and business processes) and you’ll also be able to obtain relevant information from them in order to manage your business. Pandora FMS allows the technology of your business to operate more efficiently, profitably and smoothly, while obtaining information on all the critical elements of your business and also detecting issues before these turn into problems. You will be able to evaluate the level of compliance of your systems and you’ll also be able to keep your customers informed about any incident. Its features are quite similar to those offered by monitoring suites of big manufacturers (Big 4), but at a much lower cost (up to 7 times cheaper). It shows different information for technicians, clients and managers in real time , at all levels. Strong reduction of the rate of TCO (Total Cost of Ownership). We can use your current monitoring system and integrate it and improve it with Pandora FMS. Different tools merged into one. You’ll be able to do everything with the same tool. Deployment costs are reduced thanks to its centralization and automated provisioning tools. We are flexible, and we continue to grow by learning from the opinion of our clients. It registers the events in the monitored systems in real time, visualizes them, manages them and performs event correlation. With a customized alert system and with escalation levels. Windows, Mac, Raspberry, Linux, Unix and Android. SNMP and WMI. 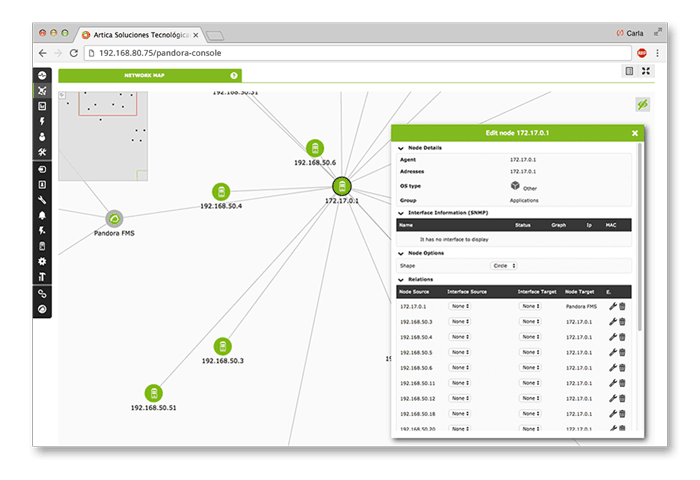 Remote plugin execution, network discovery and network maps. It obtains information on the processes of your business in real time and it is then shown in your business control panel. Complete end-to-end transactions, in web applications and desktop applications with local or distributed probes. Step-by-step statistical analysis. It unifies the element monitoring activities from the same business service, and it checks their interrelations in order to detect elements that might not work well while checking the impact on the total service. These can be customized and fully programmable. SLAs are covered in detail. Real-time dashboard with the most relevant information. Do you want further information about Pandora FMS?